A small twitter app. All about retweets, in a very incredibly easy to use way. It’s addictive!!! We show users retweets and retweets status. It may be users tweets status & stats, or user retweets status & status, user’s friends, followers status & stats. Other than this, user can see who is not following him back. User can follow/unfollow another user whom retweets he retweeted or if someone retweets user tweets. We are coming up with lots of stats around user retweets with some clean UI. There is almost no twitter app which take care so much about retweet stats. 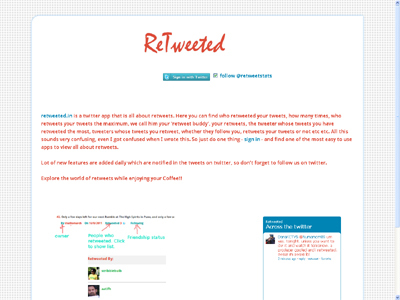 We are giving the detail description about retweets.